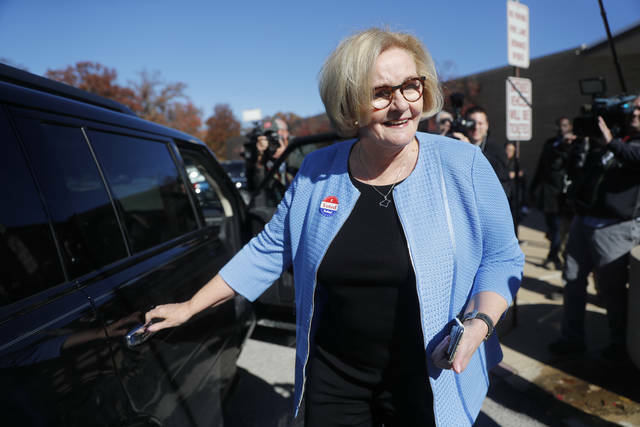 Incumbent Sen. Claire McCaskill, D-Mo., leaves her polling place after voting Tuesday in Kirkwood, Mo. WASHINGTON (AP) — Democratic incumbents were re-elected Tuesday from New Jersey to Ohio as Republicans fought to retain control of the Senate, hoping that President Donald Trump’s nationalistic appeals to hard-right voters would let them continue their role as protectors of his conservative agenda. GOP hopes of gaining a seat from New Jersey were dashed when Democrat Sen. Bob Menendez won a third Senate term. Republican challenger Bob Hugin, a wealthy former pharmaceutical executive, repeatedly attacked Menendez over a federal bribery indictment that prosecutors dropped this year after a mistrial, but Menendez hung on in the heavily Democratic state. Sherrod Brown of Ohio and Bob Casey of Pennsylvania also won re-election. They were among four Democratic incumbents facing the voters in Midwestern states that Trump carried two years ago, stunning Democrats. The victories by Brown and Casey underscored that Trump’s 2016 dominance of that swath of the country, once a Democratic stronghold, was not a lock. Initial vote counts were too tight to call a pivotal race in Indiana, where Republicans hoped to oust moderate Sen. Joe Donnelly and either pad their slender Senate majority or offset possible Democratic gains elsewhere. Also inconclusive were early votes in Democratic Sen. Joe Manchin’s battle to keep his seat in West Virginia, a state Trump carried by a mammoth 42 percentage points in 2016. He was among 10 Senate Democrats fighting for survival in states Trump carried, including five by margins of at least 19 percentage points, though most were expected to run strongly. While Republicans command the Senate only narrowly, 51-49, a crucial political equation was in their favor: Democrats and their two independent allies were defending 26 seats, Republicans just nine. Republicans were hoping those dynamics would be offset by a vibrant U.S. economy and by a president whose insult-laden approach to political discourse was as stirring for conservative voters as it was infuriating to liberals. In other early results, Vermont independent Sen. Bernie Sanders and Democrats Elizabeth Warren of Massachusetts and Kirsten Gillibrand of New York were easily re-elected. Along with Brown, the three are considered potential 2020 Democratic presidential hopefuls. Also victorious was Virginia Democrat Tim Kaine, his party’s vanquished 2016 vice presidential candidate. Republicans Roger Wicker of Mississippi and John Barrasso of Wyoming also won new terms. Democrats needed to gain two Senate seats to win a majority, assuming all their incumbents were re-elected, an unlikely outcome. But they had a plausible chance of winning GOP-held seats only in Arizona, Nevada, Tennessee and Texas. Trump’s racially tinged anti-immigrant appeals could hurt Republican candidates in swing states like Arizona and Nevada where college-educated voters could be decisive, but his rhetoric could help in deeply conservative areas. Democrats also had opportunities because of the retirements of GOP Sens. Jeff Flake of Arizona and Tennessee’s Bob Corker, both leaving Congress after accusing Trump of dishonesty and questioning his competence. There was a strong chance Mississippi’s special election to complete the unexpired term of retired GOP Sen. Thad Cochran would go to a late November runoff. Republicans who dominate the state would probably prevail, but waiting for the outcome could extend the uncertainty about the Senate’s party breakdown — and perhaps which side has control.